I’m always on a quest to find the best vegetarian food everywhere I go. 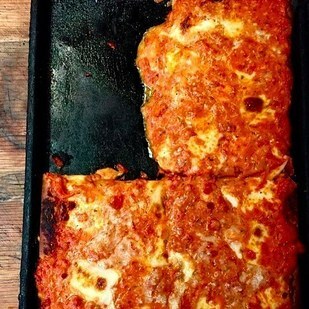 This list includes my favorites in New York City, but is by no means exhaustive. If you have other favorites, let the world know in the comments! 1. The Barbecue Buffalo Wings, Crab Rangoon, and the Bamburger from Red Bamboo. Red Bamboo makes the best vegan wings I’ve had, and I consider myself an aficionado. They are crispy and chewy, fatty and saucy, and one order of them is enough for a meal. 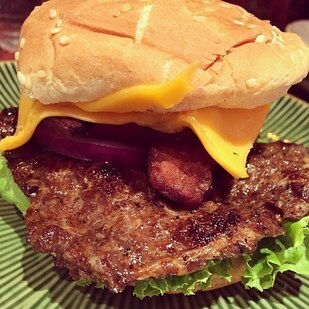 As if you needed any more convincing… when my meat-eating partner is craving a juicy, meaty burger, we go here. For a VEGAN burger. 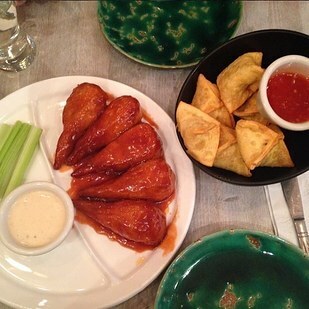 Price: Wings are $9.95, rangoon are $8.95, and the burger is $5.95. Location: 140 West 4th St.
2. 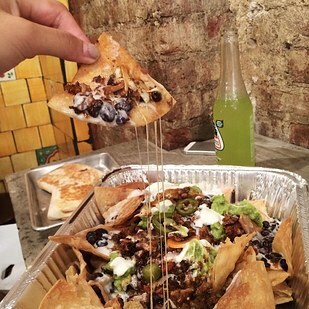 The Rajas (Veggie) Nachos at Taqueria Diana. First off, let me start by telling you that these are served ON A SHEET PAN. They are enormous. 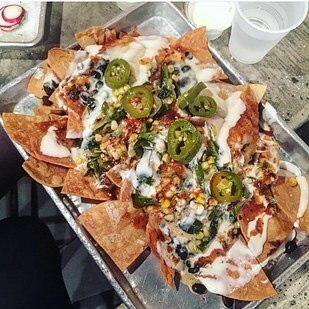 There are two options for these nachos: regular queso, which comes with beans, cheese, salsa, guac and crema, or the rajas, which comes with all that plus roasted poblanos and corn. Both are equally delicious and piled high. Price: $7.58 for the basic queso, and $9.87 for the rajas. Locations: They have two, one at 129 Second Ave and one at 601 6th Ave.
3. 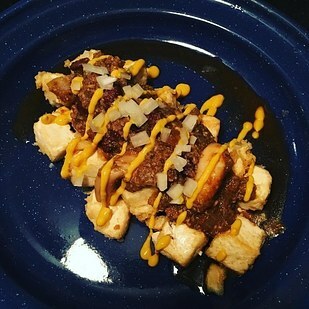 The Tofu Coney Island from Ivan Ramen. Tofu Coney Island is a dish inspired by the sloppy chili-dogs of Coney Island fame. 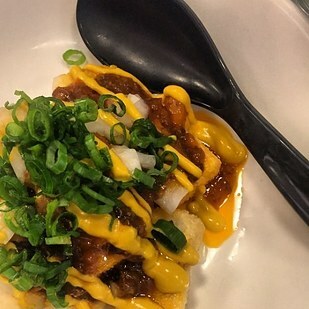 It’s basically cubes of freshly fried tofu topped with a miso mushroom chili, yellow mustard, onions and scallions. It’s pricey but delicious, and I’d choose two servings of this over the vegetarian ramen (though the ramen is also amazing). 4. 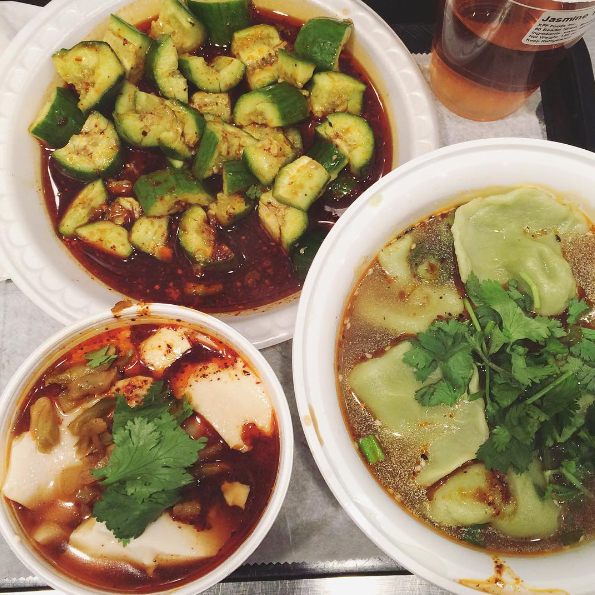 The Spicy Cucumber Salad, Chang-An Spicy Tofu, and Spicy and Sour Spinach Dumplings in Soup fromXi’an Famous Foods. 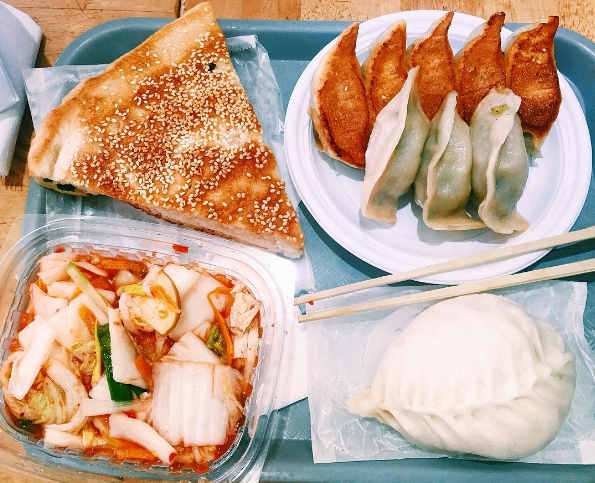 IMO, Xi’an is one of the greatest things to happen to vegetarians in NYC. It is cheap, filling, spicy and if you douse it with a little extra black vinegar, you won’t know what hit you. My suggestion is drizzle each bite of dumpling with a little bit of the spicy sauce that the cucumbers are swimming in. I am not even sorry to admit that I eat here every week and generally go through withdrawal when I don’t. Locations: They have seven storefronts between Manhattan, Brooklyn and Queens. Check them out here. 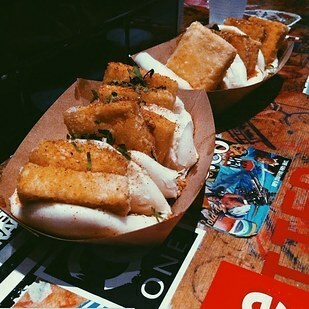 The Uncle Jesse Bao is a piece of fried organic tofu in a steamed bun slathered with “haus sauce” and covered in “haus seasoning salt,” Taiwanese red sugar, crushed peanuts, and cilantro. Price: $3.55 each (three is enough for a meal, or just get two plus some taro fries). Location: 238 East 14th St. (not far from Union Square). 6. 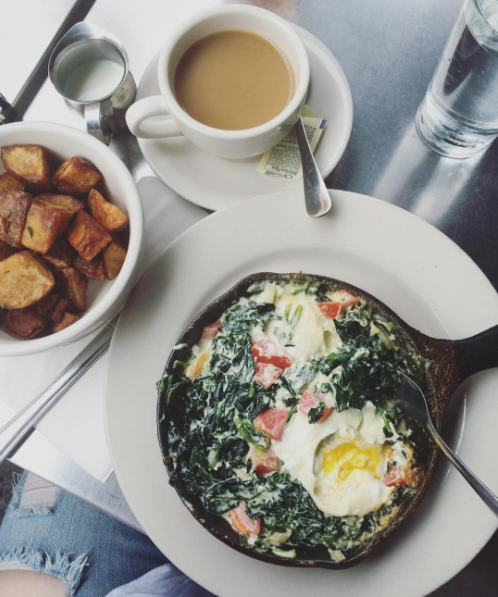 The Creamy Spinach Florentine Baked Eggs and Crispy Potatoes from Cornerstone Cafe. This place makes delicious baked egg dishes that are cheap and filling. The florentine baked eggs (and also the creamy spinach and feta one) are both excellent options. It comes served inside a skillet, and the eggs break apart ever so easily to show their golden, oozing insides. 7. 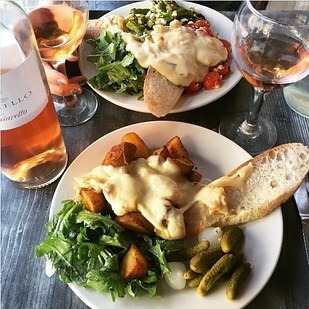 The Savoyarde Raclette Plate and the Americain Croque from Raclette NYC. Yes, this is that place you’ve seen videos of where they scrape bubbling, melted cheese onto a plate of cornichons, pickled onions, potatoes and baguette slices. 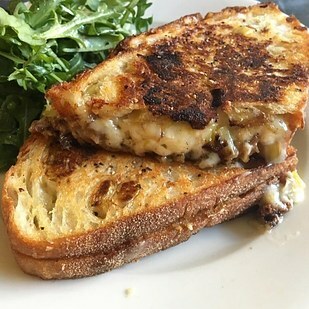 But lesser known is that they have incredible croques (fancy sandwiches) like the Americain which has caramelized onions, leek fondue, roasted garlic, and white english cheddar on bread that might as well be fried. Price: The Savoyarde Raclette is $15 and the Americain Croque is $9.64. These tacos are piled high with grilled cactus and various salsas, and you can add other toppings on the bar for free. 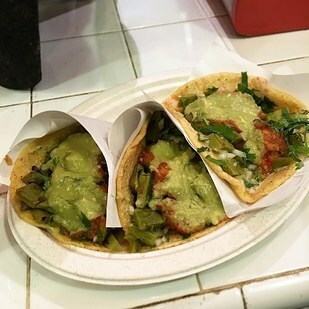 You have to order it on a corn tortilla because the flour ones are made with lard, and definitely get horchata because some of their salsas are face-meltingly spicy. Location: Chelsea Market, 75 9th Ave.
9. All of the pasta from Osteria Morini. 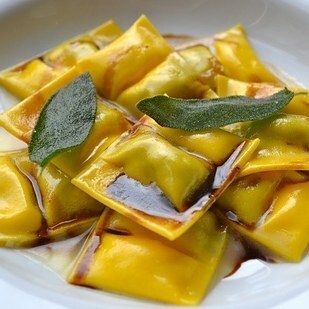 Osteria Morini has long been credited as one of the best Italian restaurants in the city. 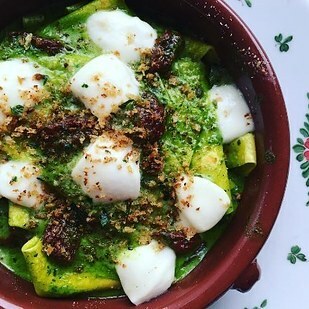 When you look at their menu, it might seem like options are limited, but firstly— the vegetarian options they do have are not basic or boring by any means and secondly—many of the dishes with meat can be made vegetarian. 10. 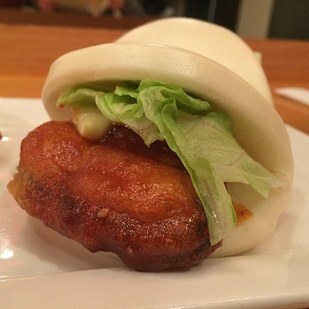 The Eggplant and Eringi Hirata Buns at Ippudo NY. In all my years of eating, traveling, and traveling for the sole purpose of eating, this bun is one of the top three best things I have ever had. It’s a thing you should eat both on your best day of life and on your worst. 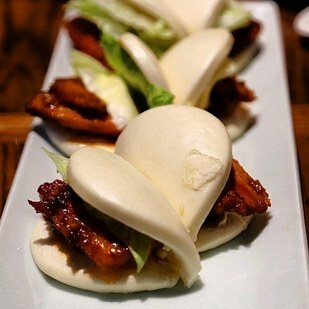 The eggplant and eringi mushrooms are fried until super crispy and tossed in Ippudo’s house spicy buns sauce, then nestled between two pillowy soft, gently sweet buns with some Japanese mayo and iceberg lettuce. 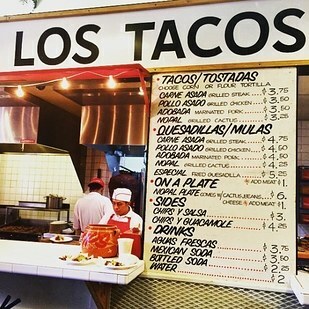 Location: They have two, 321 West 51st St. in Midtown and 65 4th Ave in the East Village. 11. 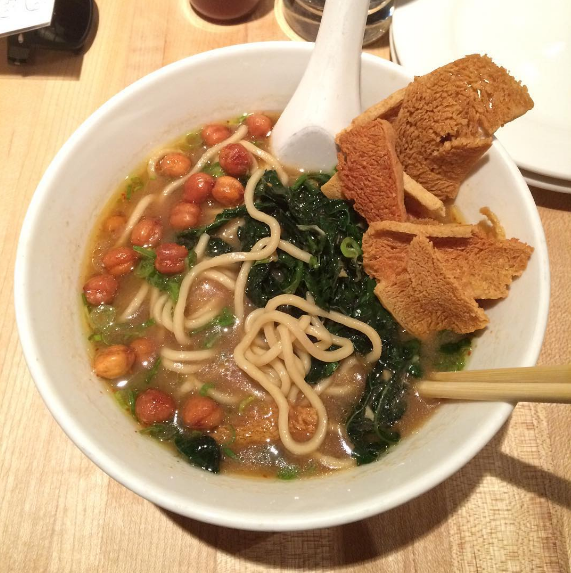 Hozon Ramen with scallions, crispy chickpeas and kale from Momofuku Noodle Bar. Of all the ramen spots I’ve eaten at in NYC (and there are a lot), no other vegetarian ramen surpasses the salty miso broth, chewy noodles, and crispy chickpea crackers that make up this dish. You should also definitely eat the shiitake buns here, too. Price: $16 for a bowl. 12. The Vodka Slice and the Artichoke Slice at Artichoke Basille’s Pizza. If you want dependable, fast, cheesy, inexpensive but not-quite-dollar-slice cheap pizza, go to Artichoke. 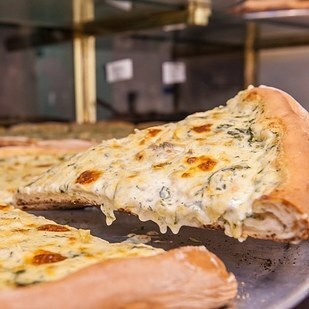 Their vodka slice is made with (you guessed it) super delicious vodka sauce, and their artichoke pizza has cream sauce, spinach, artichokes and a ton of melty, oozy, bubbly cheese. Price: Slices are HUGE and cost $4 to $5. Locations: They have several in Manhattan and Brooklyn. Check them out here. 13. The Sesame Pancake Sandwiches and Pan Fried Vegetable Dumplings from Vanessa’s Dumpling House. Vanessa’s makes these incredible sesame pancakes that are basically like fried bread stuffed with either pickled veggies or egg and pickled cucumber. My favorite is the egg version, along with a heaping helping of pan fried veggie dumplings. Price: The pancake sandwich is $2.75 and the dumplings are $2.25 for four (no, I’m not lying!). 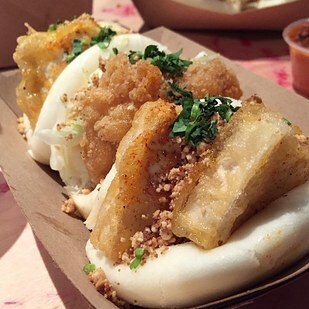 Locations: They have many (one in Chinatown, one by Union Square, and another in Williamsburg). Check them out here. 14. 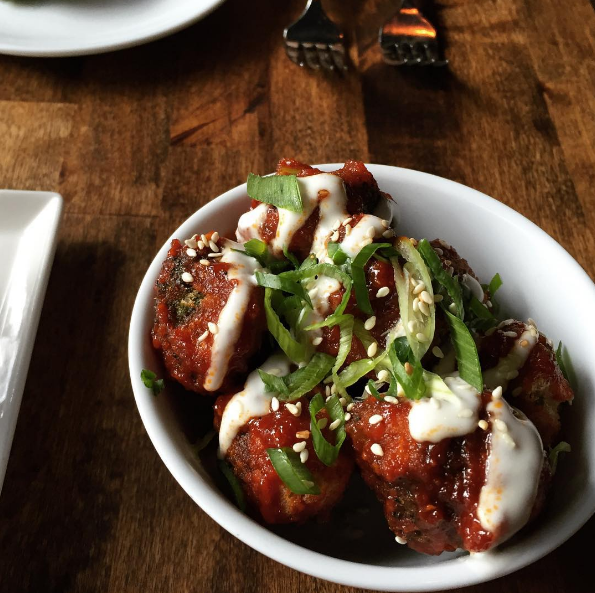 The Korean Fried Broccoli at Dirt Candy. The menu aptly describes this as “basically crack in broccoli form.” It’s crispy, crunchy, deep fried broccoli with a spicy-sweet Korean chili sauce, mayo, scallions and sesame seeds. FYI, Dirt Candy’s whole menu is vegetarian and they are consistently ranked one of the best upscale veg restaurants around. 15. 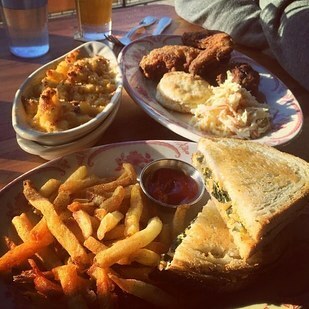 The Pimiento Cheese and Collard Greens Grilled Cheese and the Mac and Cheese from Bobwhite Counter. 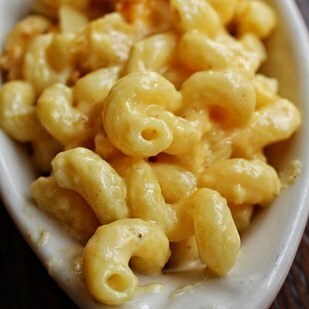 Price: The sandwich is $7 and the side of mac and cheese is $5.50.